Church of C11 origins with a major building campaign in the C13, and C14. Further works, including the completion of the west tower, in the C15. Subsequent alterations and additions, principally the restoration by George Dance Senior after a serious fire in 1762 and Victorian restorations by Slater and Carpenter between 1859 and 1887. MATERIALS: Principally Kentish ragstone and knapped flint with pitched tiled roofs. PLAN: Aisled nave with south transept; west tower; south porch; chancel built over a crypt with a north chapel/vestry and south chapel. EXTERIOR: Principal elevation to the south onto the High Street: Handsome west tower begun in the late C13 and completed in the C15. A robust structure of four storeys, stepped angle-buttresses, external semi-circular stair tower to the south rising to a polygonal turret above the roof parapet. South aisle also with a parapet and stepped angled and intermediate buttresses, of late C13 or early C14 date. Main entrance through south porch: flat roof with parapet, diagonal buttresses, vaulted roof to interior and anthropomorphic stops to arched entrance. Transept has very large Perpendicular south window. Flint work here is of a different form being large, roughly knapped flints. South chapel is of circa 1300 with Perpendicular alterations. Canopied niche on the south-east buttress is recorded as housing a statue of St Mary (no longer in situ). Large east windows to south chapel and chancel. Window tracery in the main reinstated during Victorian restorations. INTERIOR: East half of the chancel appears the oldest fabric: two blind lancets (originally external) in north wall set under two large blank arches. Two similar but wider C13 arches on the south side, later pierced to provide access to the south chapel and restored in C19. Western arches on north side of chancel are late C13. Crypt beneath chancel with quadripartite rib-vault with chamfered ribs. West wall blocking prevents access to remainder. South chapel and its original south window date it to circa 1300. Impressive Perpendicular window to transept. Nave arcades of three wide arches on alternating octagonal and round piers. Corbels with a mixture of finely carved heads and cruder examples of anthropomorphic and zoomorphic forms at the junction of the nave and the south transept/aisle. Barrel vaulted nave roof divided into panels by exposed ribs. Boarded aisle roofs divided into panels by ribs; also exposed timbers in chancel roof. Nave, chancel and aisle roofs were all constructed in late C18 restoration after fire destroyed the medieval roofs but have undoubtedly been restored since. West tower has ringing and bell chambers. FIXTURES AND FITTINGS: Reredos of 1860 by Slater with central panel decorated with an embossed Greek cross flanked by paired stone recesses with slender columns and trefoil heads framing images of angels on a gilded ground. Good east window of 1860 by Clayton & Bell depicting the Last Supper. Organ by William Hill & Son, London, installed in 1881 in north of chancel and reconstructed and enlarged in 1928. Replaced an organ of 1822 in the west gallery (which no longer survives). Monument in north aisle of reclining shrouded female with swaddled baby under a segmental recess, much worn but appears early or mid C15. Good quality octagonal font, probably early C15, decorated with coats of arms. Other glass: one north window designed by Kent ecclesiologist, Dr Grayling, incorporating old glass. South aisle west window of 1844 by Willement. Other glass by Clayton and Bell and Willement. First World War and Second World War Memorial Windows and window commemorating the coronation of Queen Elizabeth II in south transept. Peal of eight bells: six dating to 1687, a further late C17 bell was recast in the late C19 and remainder are late C19. ANCILLARY FEATURES: Churchyard wall and gate piers, also in knapped flint with stone dressings. Gate piers rise from plinths, are square in section and have pyramidal caps with gables on each face. HISTORY: There was a church on this site from the C11 but there is no architectural evidence which can be confidently ascribed to this date although it is clear that elements of the chancel exhibit the earliest surviving fabric. It is in the C13 that the present St Michael's truly begins to take form and was largely complete by the late C14 with the completion of the tower attributable to the C15. The building was gutted by fire in July 1762, caused during repairs to the lead roof which was destroyed leaving only the bare walls of the church although the tower escaped the destruction. The restoration was overseen by the architect George Dacre Senior (who took out most of the tracery) and was completed in 1767. The south transept and Lady Chapel were used as a school in the early C19 and were partitioned off from the main church with access through the now blocked round-headed door in the west wall. The church was also subject to Victorian restoration by Slater and Carpenter between 1859 and 1887. The bells were re-hung in a new frame in 1896. 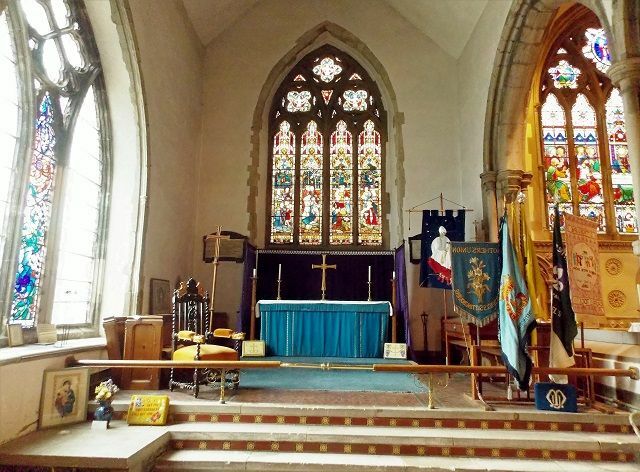 C20 alterations include the addition of a First World War memorial window in the south transept in 1920. The building was extensively restored in the 1960s. St Michael's is a sister church to St Mary's Sittingbourne which is of early C20 date. St Michael. The Parish Church of Sittingbourne for nearly 1000 years. Draft church guide, 2003. * Architectural details of interest including: carved stone heads to the exterior and interior, a C15 font and tomb, and good stained glass (particularly the Victorian east window of the Last Supper and a memorial window to the First World War in the south transept).